At this meeting we learned about an Opensim whiteboard tool designed by Trevor Meister and visited a There.com outpost on NewWorldGrid created by Mike_37uk There. 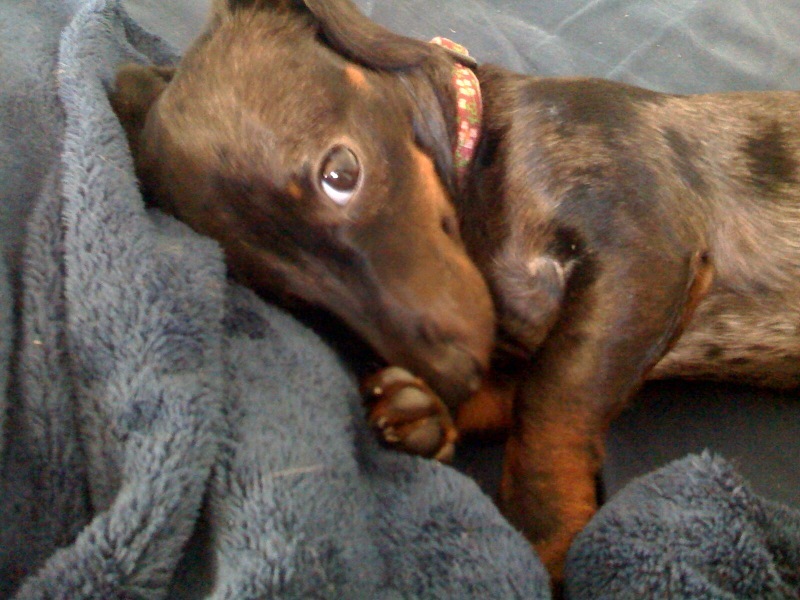 We also briefly discussed dachshunds. A subject very dear to me. Pathfinder Lester: sorry Im a little late. was hard to walk my dog this morning. 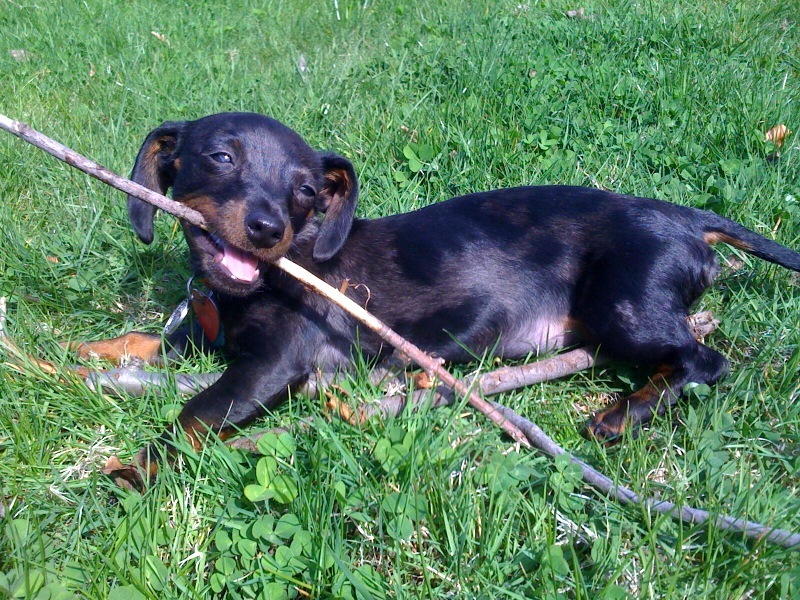 Sail Woznaik: I have a dachshund too…. she is refusing to go out in the snow. 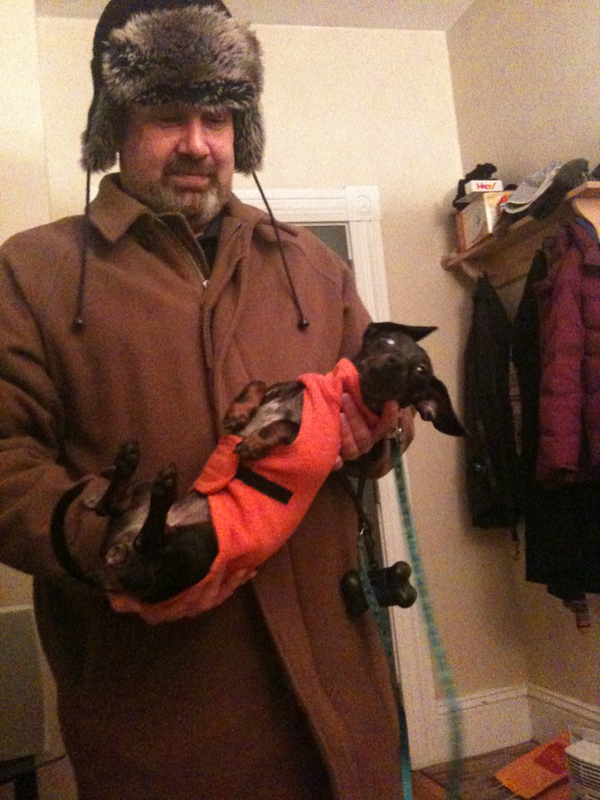 I will now take this opportunity to share some photos of Samantha, the snow-hating dachshund. I now return you to our regularly scheduled chat transcript. Thank you for your time. Trevor Meister: Do you have a series of tunnels in the back yard? Pathfinder Lester: Trevor, i wish! Pathfinder Lester: Same with mine! she hates swimming. hates rain and snow. loves digging. Pathfinder Lester: Ange, how did the Winterfest on FrancoGrid go? Trevor Meister: Trevor Meister Edmonton Canada….used to teach math/physics 20 yrs, now in elearning development….would give my right arm to work full time in 3D for a company like…say Reactiongrid…. Sail Woznaik: Sail, been in Sl for 3 years, first as a professors of education in a masters program, then as part of Imagilearning in SL. just got land here and hope to expand on my skills and create a community. I am hoping to be a part of a initiiative for 3D learning at Duke that is trying to get underway in their medical and nursing school. Pathfinder Lester: Sail, very cool! Is there a webpage we could check out to learn more about Duke’s medical project? Sail Woznaik: not yet underway.. still working on the funding..
Pathfinder Lester: Sail, gotcha. I’ve been learning all about unity3d lately. Very interesting tech. Graham Mills: Is RG’s Jibe based on Unity? Sail Woznaik: yes, good for small simulation, but they also need to combine it somehow to use with bigger groups of people. Pathfinder Lester: Trevor, do you want to talk about your new invention now? Pathfinder Lester: Graham, you can also use things like google sketchup to make models for unity. that’s what i’ve been using. Sail Woznaik: I have been trying to learn blender also. Graham Mills: Sorry for interrupting — what’s Trevor’s invention abt? Pathfinder Lester: it’s a shared whiteboard! NOTE: Trevor has left a boxed copy of his whiteboard for anyone who wants to grab a copy. Just look for this box sitting next the campfire on Pathlandia. Pathfinder Lester: thanks for coming by and showing this! Trevor Meister: Willl come for the tour on Sunday.;.. Ange Menges: I am making some tests with the last release of whisper/murmur. Do someone here use it ? Pathfinder Lester: Ange, oooh cool! I have never used it. i read about how it was just released as open source. very very cool! Graham Mills: url for blog, Ange? Graham Mills: Is it spatial? Pathfinder Lester: i don’t know. i haven’t tried it yet. Pathfinder Lester: this board that Trevor made is great. i love playing with it. Pathfinder Lester: Ange, oh good, that’s helpful. Pathfinder Lester: yeah, we have that problem with freeswitch on ReactionGrid’s public grid. A Therian outpost created by “Mike_37uk There” for members of the now closed virtual world There.com. A place where old friends can meet and build their own community. There is an information center in the main tower, freebies and some There.com memorial website links. Also includes a hypergrid portal to other worlds, a dance club, a photo booth, and a freebie shop with skins and clothing, Oriental rugs, and textures. Mike_37uk recently set up another home on jokaydiaGRID, also named “Cosmo Island.” Be sure to stop by and welcome him to the neighborhood. Pathfinder Lester: did anyone here use There.com? Graham Mills: yes, he was here last week? Pathfinder Lester: Graham, yep! he was at our meeting last week. Pathfinder Lester: it closed down a couple years ago. it was like SL in a few ways. but you couldn’t build inworld. Pathfinder Lester: had an economy, you could buy things, it was full 3d with voice, etc. Pathfinder Lester: fun place, too. the devs spent a lot of time working on making the avatars have lots of social gestures built-in. Pathfinder Lester: but they ran out of $ and eventually closed. Pathfinder Lester: many people emigrated from There.com to SL when that happened. Pathfinder Lester: i remember when i was working at LL, we set up an area in SL to welcome all of them. Blue Linden worked a lot with their community. Pathfinder Lester: and Mike_37uk has spent a lot of work with those folks in opensim, too. Pathfinder Lester: and there are still websites where former There.com avatars keep in touch with each other. Pathfinder Lester: it’s always tragic when a virtual world shuts down. but people often build communities that are much more enduring than the worlds in which they exist. Pathfinder Lester: any of you ever use Google Lively? Google’s 3d world? Pathfinder Lester: Google Lively only existed for a few months before Google shut it down. 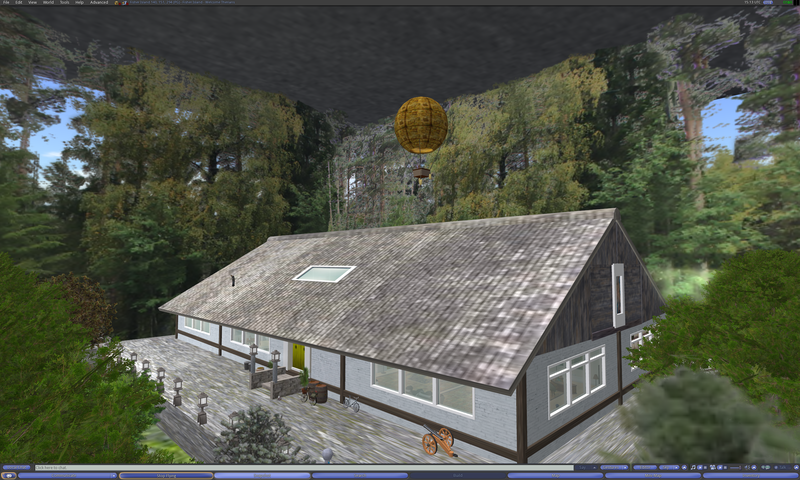 web-based 3d world. Pathfinder Lester: barely had time to get started before it was gone. Pathfinder Lester: Graham, good point. that can be problematic for compatibility. Pathfinder Lester: here we go! We walk through an Instant Hypergate (aka “Blamgate) on the region Pathlandia on jokaydiaGRID. Pathfinder Lester: 1) Open your World Map. We all make a Manual Hypergrid jump from the region HG Gateway 1 on ReactionGrid, and arrive on the region Cosmo Island on NewWorldGrid. Here are the contents of the notecard given out by the Tourist Information Kiosk. The oldest surviving sim from the first series of Therian sims on the New World Grid ( NWG ). Features a main square, Club House, some outbuildings, and the Information Point tower with its freebies and there.com memorabilia. There is also a sandbox, a hypergate, and the Cosmo Design Studio building. This sim has a distinctive industrial feel to it with its large Fisher Warehouse Building ( a few surprises inside ) and smaller outbuildings nearby. There is a small harbour with a few boats and a sandbox area. Visitors from the now closed there.com world will recognise the medieval cottage, along with its pub sign that was used in the England World Hood in there.com. On the other side of the island there are the freebie shops, a large sandbox area, and a container ship berthed alongside the quayside. 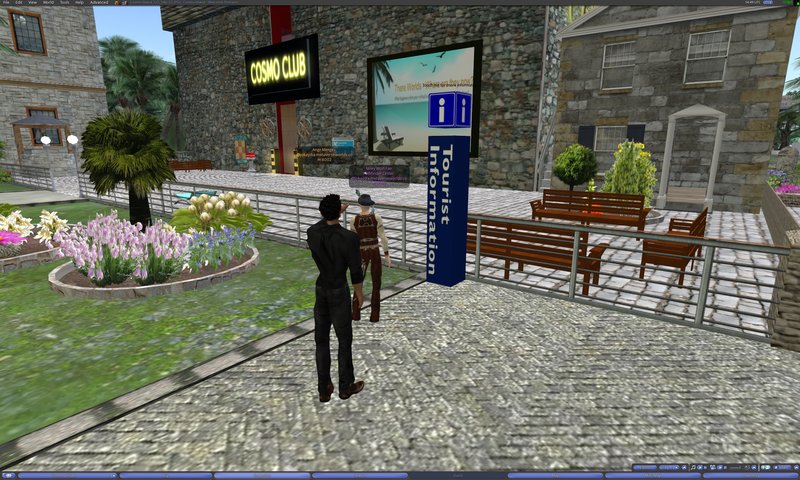 The hypergrid terminal can be located alongside the cafe in the shopping area main square. The Welcome Point building on Zona Island has some free clothes and its own hypergrid Gate and sandbox. Duda is different. Its sandy beaches and colourful themes set it apart from the other sims. The sim features a ranch, natural harbour and a number of interesting buildings. 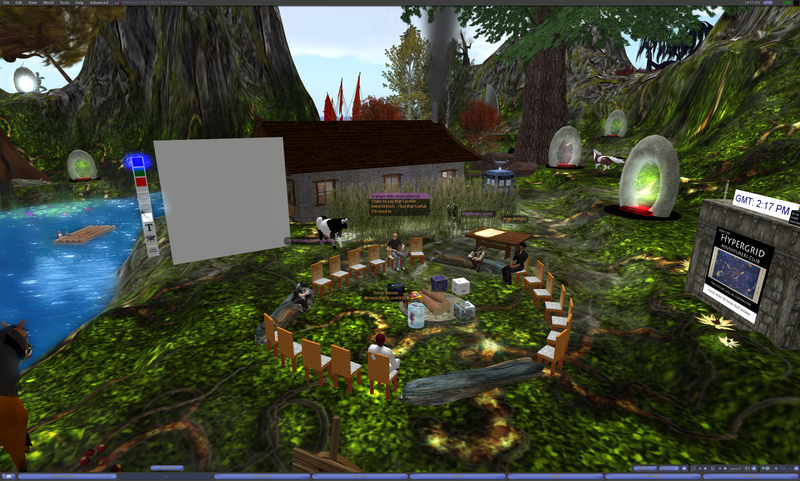 Duda has its own hypergrid gateway, log campfires and a there.com kissing booth! This was the name of the original island when there.com closed. 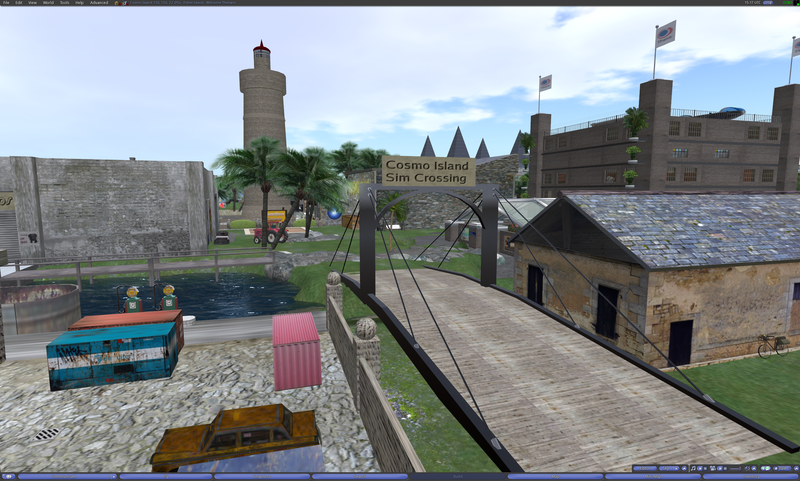 It only ran for a short period of time before being abandoned when earlier and more unstable versions of open sim caused a mass exodus to Second Life. Thankfully NWG is now one of the most stable grids around. It has voice capability and sim crossings and crashes are now infrequent. Life After There is an organised residential district where land can be obtained free for ex there.com members. New members to the NWG should first land at Welcome Point and familiarise themselves with this PG world. The teleport centre in the Welcome Building is a good place to start. The Cosmo Island teleport board can be found inside. The next port of call should be the Free Market to customise your avatar and pick up the freebies. From there take a trip to the Sandbox area for a second building packed full of freebies. Miley World is definitely worth visiting since Dordy and Miley have put a lot effort into providing the NWG with some additional free goods for all residents. Graham Mills: So he’s basically recreated the content from There? Pathfinder Lester: maybe we can meet a couple folks who are there now! Micca There: how r u guys ? Pathfinder Lester: doing well, thanks! Pathfinder Lester: well, our club explores as a group. Micca There: how do I do that ? Micca There: have you met Mike ? Pathfinder Lester: Micca, so you were in There.com too? Pathfinder Lester: oh no worries! Sail Woznaik: yes, there are many 1st times here. At this point the region apparently rebooted and we were all logged off. But we quickly regrouped and continued exploring. Pathfinder Lester: maybe the region rebooted? Graham Mills: It wasn’t just me then? Pathfinder Lester: we are hardy adventurers! Pathfinder Lester: I’ve got to head out now. Have a good day, everyone. Take care. And so ends another excursion and meeting of the Hypergrid Adventurers Club. Until next time! This entry was posted in Announcements, Avatars, Hypergrid Adventurers Club, OpenSim, Uncategorized, Virtual Worlds and tagged avatars, dachshund, education, HyperGate, HyperGrid, Hypergrid Adventurers Club, jokaydiagrid, metaverse, online communities, OpenSim, ReactionGrid, there.com, virtual worlds, whiteboard by John "Pathfinder" Lester. Bookmark the permalink. And thanks, Trevor, for that whiteboard! Hope you get that job you’re looking for! Is whiteboard copy still available? Just visited campfire and did not see it. I’ll put it out again. It got lost when I moved my Pathlandia region from jokaydiaGRID to my own grid. Thanks for the reminder! 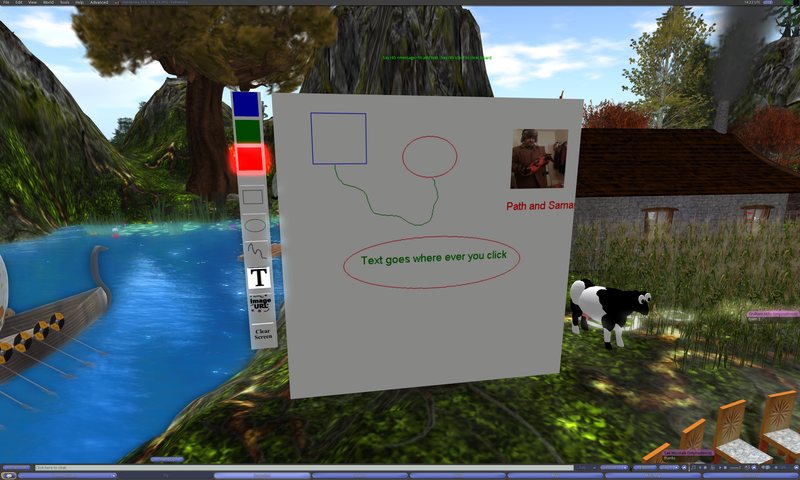 I would love a copy of that whiteboard too for the Metaversity group in Osgrid, however i am not seeing Pathlandia Grid as being online. Is there anywhere else it is available? Hi Arielle. Sorry, my Pathlandia Grid was offline for a few days. It’s back up now. I left a copy of the whiteboard for you in the cabin on the table. Let me know if you get it OK.